Modern What? 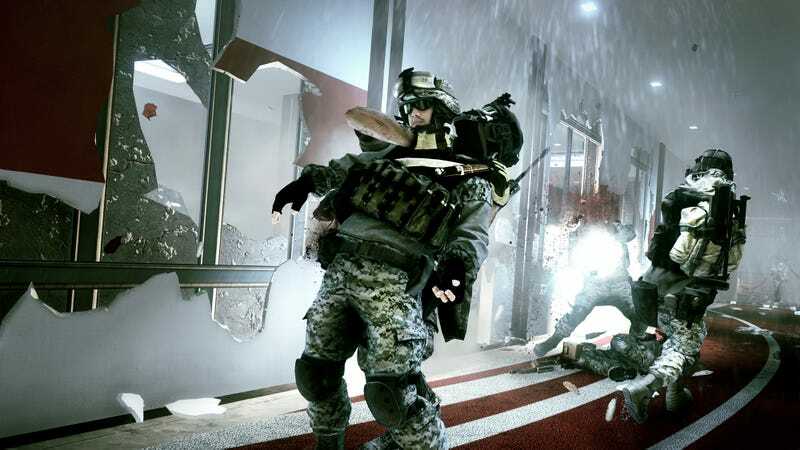 No, Look at this Battlefield 3 Expansion Trailer. Over Here. By sheer coincidence, total accident and obvious happenstance, today, on the day that three new maps are made available for Modern Warfare 3's Xbox 360 Elite subscribers, we've been given a trailer to show you for some new Battlefield 3 DLC. It's just amazing how this happens. It's like, no sooner do we tell you that the first $15 Modern Warfare 3 downloadable content collection is coming out (for next week), then—bam!—here comes the trailer for the next $15 Battlefield 3 expansion. The weird thing is that I was shown all of this stuff last week, and the MW3 people had already picked today as the day for their new maps. The BF3 people picked the same day to let the world see their new DLC trailer. This trailer is for Close Quarters, BF3's June 2012 DLC pack. Four maps (hey, that's two fewer than the MW3 pack! ), 10 new weapons and an emphasis on infantry combat. The creators of the expansions say they want to deliver more than a map pack. They want to offer something that suits a theme. The already-released Back to Karkand, for example, was a throwback to classic maps in the Battlefield series. Later DLC expansion will focus on giant-map vehicle combat and something that suits the title "End Game." The trailer's good, and all, but the coolest thing publisher EA and development studio DICE are showing might be this single before-and-after screenshot.